It seems like a new theme is developing on The Walking Dead. In order to set the mood for a particular scene near the end of an episode, The Walking Dead has been playing end songs. 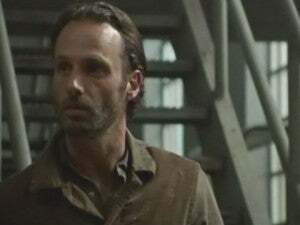 Tonight, the end song played as Rick Grimes told his group at the prison that they were going to war with The Governor. Lots of fans have turned to Twitter seeking the name of the song, so here it is. The Walking Dead end song on the “Arrow on the Doorpost” episode was “Warm Shadow” by Fink. Here’s a sampling of the lyrics.